In their popular work, The Last Week: What the Gospels Really Teach About Jesus’ Final Days in Jerusalem, Jesus scholars Marcus Borg and John Dominic Crossan talk about the contrast between Jesus’ entry into the East Gate of Jerusalem with Pilate’s military/imperialist entry into the West Gate of Jerusalem on the same day. They state the simultaneous nature of these events with a little more certainty than is historically warranted, but we do know that Pilate did not normally reside in Jerusalem, but arrived with extra troops every year to keep the crowds from revolting Rome’s rule during Passover. After all, Passover celebrates the Exodus, God’s liberating of His people from another oppressive empire long ago. Discontent in the Jewish crowds would be strongest during Passover. So, Pilate comes from the West with extra troops on war horses in a military display to cow the masses. By contrast, Jesus arrives from the East in a carefully staged (getting the colt/foal of a donkey) counter-demonstration. Drawing from Zechariah (not lost on the crowds), he presents a salvation from imperial rule that is not based on greater firepower, but on peace and meekness. When we celebrate Palm Sunday, we don’t just remember the fickle crowds (so soon to desert Jesus, along with the 12) and their brief recognition/celebration of Jesus’ triumphal entry. We also remember that Jesus presents us with a deliberate choice: Following His Way of meekness, humility, and peace or the Way of Empire and military might. There is no Way to follow Jesus that does NOT break from the military option. I receive emails asking me questions WAY outside my fields of expertise. One recent one asked for an account of the canon of Scripture: how we got the books in our Bibles, how various ones made it in or didn’t, why differences (in the Old Testament) between Catholic, Orthodox, and Protestant Bibles, etc. Well, I’ve read some works on this topic, but not recently. So, I contacted some biblical scholars that have their own blogs and asked if any would be willing to post a series on the same–aimed at laity. My old friend, Darrell Pursifal, who blogs as “Dr. Platypus,” decided to take me up on it. Read Darrell’s blog, regularly. It’s fun and informative even if/especially because he doesn’t always agree with me! Update: Here is Darrell’s post on the NT canon. UPDATE: Darrell’s site is currently experiencing some kind of technical difficulty. When it is fixed, I will notify all my Gentle Readers in this space. Problem fixed, I think. It was not Dr. Platypus’ problem, but mine. Helen Barrett Montgomery (1861-1934) was born 146 years ago, today, 31 July 1861. A friend of Susan B. Anthony and, like Anthony, a pioneer feminist and suffragist, Montgomery was active in social reform and became elected to the Rochester, NY city council–in a day when it was still considered shocking for women to walk outdoors unaccompanied or to speak up in mixed gender public assemblies. A graduate of Wellesley College(A.B., 1884), Montgomery placed first in her Greek course, which came in handy later. A Baptist layleader, Montgomery worked hard for the cause of missions, writing books on missions and prayer. She also became the first known woman to translate the New Testament from Greek to English and have the translation published professionally. Montgomery’s translation of the New Testament was published by the American Baptist Publication Society (forerunner of Judson Press) in 1924 as a celebration of ABPS’s 100th year of publication–which is why it was called the Centenary New Testament. It remained in print until the 1990s (and I used to give it to women ministers when they were ordained). Montgomery’s translation appears to have been the first to put titles on chapters and sections of the Bible and moved the verses to the side of the page to make it easier to read the text in paragraphs. 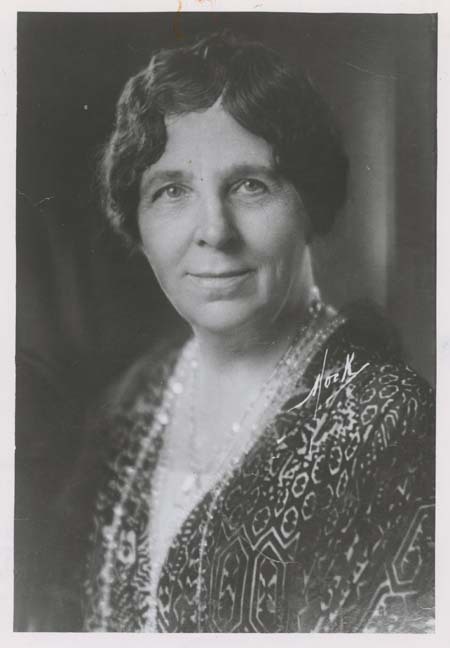 In 1921, Montgomery was elected President of the Northern Baptist Convention (now American Baptist Churches, USA), the first woman to serve as head of a major Christian denomination and one of the few laypeople to hold such an office. Although never ordained, Montgomery was licensed to preach and frequently led the worship at Lake Avenue Baptist Church, Rochester, NY when the pastor was absent. For ten years she was president of the Women’s American Baptist Missionary society and she was also elected president of the National Federation of Women’s Boards of Foreign Missions. In addition to missions and the struggle for universal suffrage, Montgomery also championed such causes as the elimination of poverty, free public education, and peace. Happy Birthday, Sister Helen! May your life and witness inspire many today, especially among women and Baptists! I was going to note that on 12 July 1906, the famed Neutestamentler Ernst Käsemann(1906-1998), who launched the “Second Quest for the Historical Jesus” was born. But, Jim West beat me to it. Jim, however, seems to have missed the significance of today for another giant in church history. 12 July 1536 was the day that the Catholic humanist and biblical scholar, Desiderius Erasmus (1466-1536) died. Erasmus, from Rotterdam in the Netherlands, prepared the Greek New Testament that was a major factor in the launching of the Protestant Reformation. Although remaining Catholic, Erasmus influenced Luther, Zwingli, and several of the Anabaptists. Erasmus was also a pacifist–although of a very different type from most of the Anabaptists. He attempted to reform the Catholic Church from within, and was as shocked by the willingness of Reformers (both Magisterial and Radical) to split the Church as he was by the excesses and superstitions of late Medieval Catholicism.